Late last night this. . . . .
began morphing into this. . . . .
and it’s still growing. And I don’t know what it’s going to be when it grows up. Can’t wait to see what happens when the Ugly Duckling turns into a Swan. Oh, I love vintage barkcloth. Can’t wait to see the “after” photos. Come for a visit if you get the time. Wow, what a metamorphosis. This will be fun to see how this turns out. Love what you’ve done so far. This truly represents hope for us all who have a similar box of stash just waiting to be used-lol. Awesome is what it will be when it grows up. I cannot wait to see it all done! i would love it to become a quilt for my bed. hint hint… there is nothing that barkcloth can’t make more fantastic. oh yeah, thanks for the recent visit to my etsy store too. i have my fingers crossed that you will make another mirror with your new flowers. i have a mirror waiting to imitate yours… when it grows up. now this looks like some good stash fun! I’m guessing it will become one very special apron! Forgive me for not answering your email ~ it’s been a crazy couple of days for me. 🙂 Thanks for letting me know about the web information! You are kind to let me in on some of your secrets (hahaha!). I love looking at your blog ~ the buttons at the top are beautiful. They didn’t come up on my computer the first time I was here; and now I can see them! Lovely, lovely, lovely!! You are very creative and I can’t wait to see what your project becomes!! Oh! Whatever it is, it will be gorgeous! 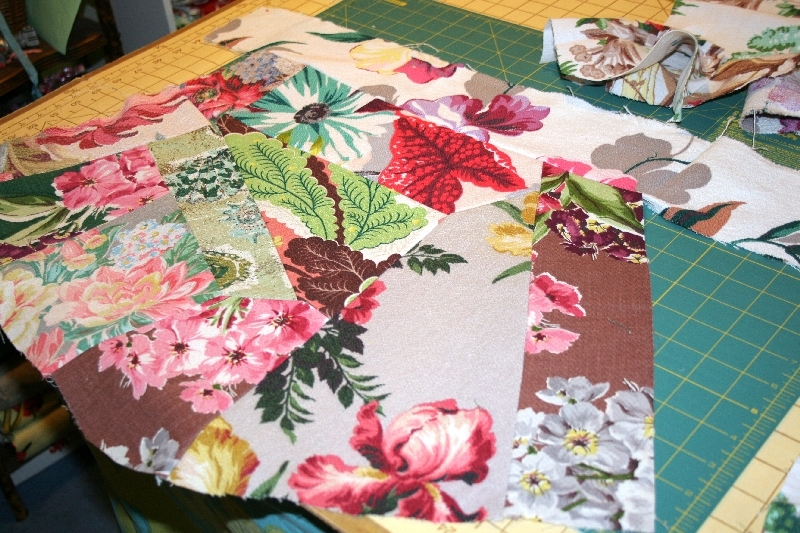 I started a couple of weeks ago in this same free form way with a bunch of fabrics. It was so great and the creative energy really took off. Good Luck, beautiful fabrics. 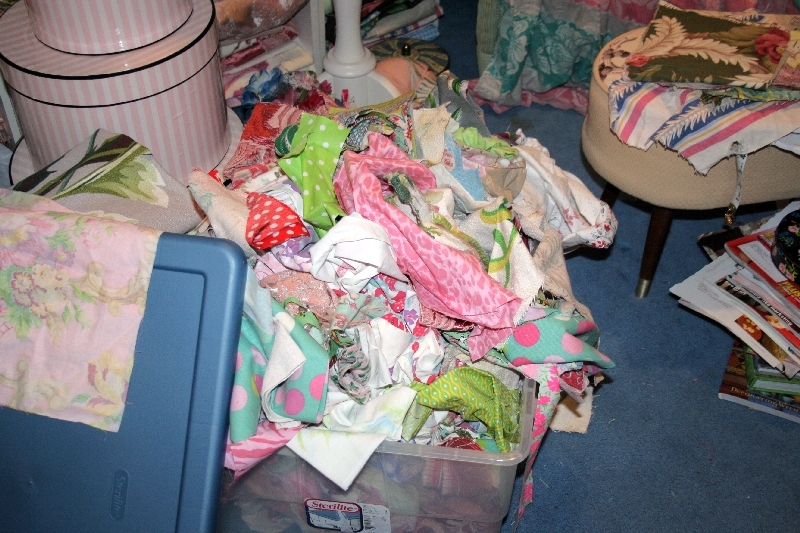 Suzy, If I could be anywhere in the world right now, I’d be sitting cross-legged in front of that overflowing tote having a look at all your colorful scraps. Love ’em! How beautiful, I love the fabrics. Love your fabrics – it looks like the shape of a lampshade perhaps? I too, think it is going to be an apron!!!! You were shopping in my area! I live on the Peninsula! I have frequented the shops you mentioned.